Pearl Zanchetti, age 98, passed away Thursday, March 8, 2018, at AngelsGrace Hospice in Oconomowoc. She was born in Cudahy, WI, August 28, 1919, daughter of the late Anton and Emily (Nee: Halembiec) Walman. On April 30, 1942 at Holy Family Catholic Church, Cudahy, she was united in marriage to Roger Zanchetti who preceded her in death July 10, 2000. Pearl worked at Willie’s Sentry Foods on Douglas Ave. for over 25 years, retiring as Deli Manager. 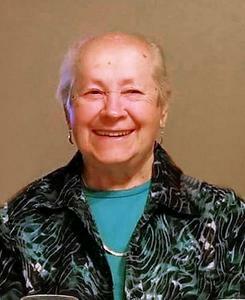 She was a longtime member of St. Rita’s Catholic Church and a longtime volunteer for Toys for Tots and the PADS program, cooking and providing meals for the homeless. Above all she treasured time spent with her family. She was a devoted wife, mother, grandmother and great grandmother who will be dearly missed. Surviving are her children, Roger W. Zanchetti of Chicago, Susan Mary Scheible of St. Louis, MO, Mark (Pam) Zanchetti of Oconomowoc: grandchildren, Ann Scheible (Dennis Luebbers), Matthew Scheible, Mary Katherine Scheible, Christina Zanchetti, Nicole (Travis) Housey; great grandchildren, Cecilia and Dexter Housey; nieces, nephews, other relatives and dear friends. In addition to her parents and husband, she was preceded in death by her brother, Walter and sisters, Antoinette Blicharz and Lottie Gale. Relatives and friends may meet at Holy Cross Chapel, Hwy 32, Tuesday, March 13, 2018 10:30 A.M. A Prayer service will be held at 11 A.M. Interment will follow. Memorials to Toys for Tots or HALO (Homeless Assistance Leadership Organization of Racine) have been suggested. The family wishes to extend a special thank you to the staffs at Shorehaven Lutheran Home and AngelsGrace Hospice of Oconomowoc for their loving and compassionate care.